The RiskyProject schedule and cost risk analysis workflow includes four major steps, as shown on the diagram. Each step includes a number of activities and each activity is associated with at least one RiskyProject view. First, create a baseline or original project schedule. The baseline includes the project schedule that can include resources and costs. 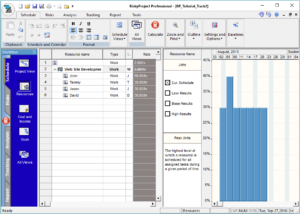 The baseline can be created in RiskyProject or imported from Microsoft Project or other scheduling software. In addition to the schedule are added risk events from the risk register and uncertainties for cost and duration. In addition, risks and tasks can be correlated. Second, run a Monte Carlo simulation. The simulation can be optimized to meet your requirement. These settings include the number of simulations, convergence monitoring, and defining confidence levels for low and high results. Third, the results of the simulation are analyzed. 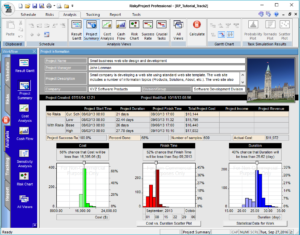 This includes viewing the project summary that includes overview of project cost, duration, finish time with and without risk, histograms and cumulative probability charts, and joint confidence. 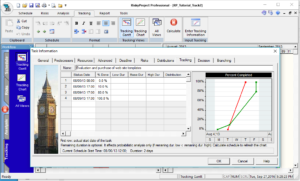 Advanced analysis includes intuitive views including a Result Gantt, Cost Analysis, Cash Flow, Sensitivity, Risk Chart, Success Rate, and Crucial Tasks. Finally, during the course of the project, actual performance is monitored and tracking information is updated. All process can be repeated again as soon as new data about project performance become available. RiskyProject allows you to compare baseline schedule with the calculated schedule that takes into account risks, uncertainties and actual project performance. At any step in the workflow, the data and simulation results can be viewed in several different formats. In this step, the project schedule is defined along with uncertainties, resources, and risks. 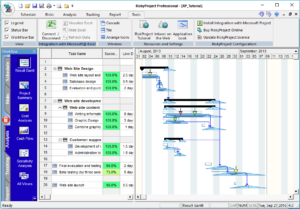 Task scheduling in RiskyProject is very similar to the process project managers use with traditional scheduling software and methodologies. 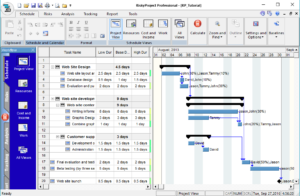 The project schedule is based on tasks and is presented as a Gantt chart. 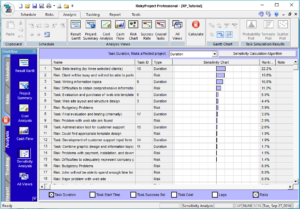 The project manager specifies input project parameters, such as: duration, start and finish time, cost, etc., that are associated with a “best case scenario” outcome. 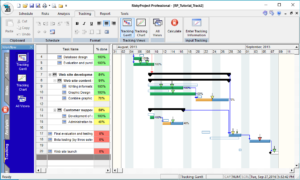 You can use project schedule created in Microsoft® Project, Oracle® Primavera, or other project management for the risk analysis in RiskyProject. After calculation, the risk register will present calculated risk impact, risk probability and risk score, which is equal probability multiplied on impact. The risk register also may show probability, calculated impact and score of the risk after mitigation. The risk register can be exported and used for other projects. 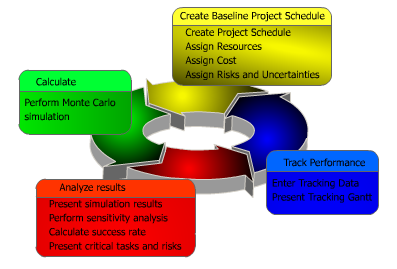 You can now perform Monte Carlo Simulations of Project Schedule. To calculate the project, click the Calculate button (for small projects calculations are done automatically) and Monte Carlo simulations are performed. RiskyProject offers a number of tools with which you can analyze the results. Interactive charts are also provided, which allow you to determine the chance the project will be completed on certain date, will have a certain duration, and will have a certain final cost. The project Summary also provides the overall project success rate, or chance that project will be not canceled. 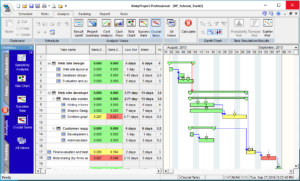 The Result Gantt chart provides an easy way to view the low and high ranges for start and finish dates for each task. It also allows you to view the baseline and calculated project schedules side by side. This allows you to quickly determine how uncertainties affect each particular task. This is also an opportunity to perform a reality check. With the Result Gantt chart, you can easily see how the project schedule slips due to uncertainties and determine whether your initial estimates for the project and the risks and uncertainties were correct. The sensitivity chart displays sensitivities in descending order: variables whose uncertainties affect the project schedule the most will are placed at the top. RiskyProject calculates every task’s success rate or chance of completion. 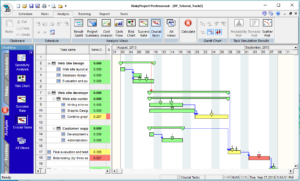 The results are shown on the Success Rate Gantt chart using different colors. Tasks with high success rates are green, medium success rates are yellow, and low success rates are red. You can cancel tasks, if a risk with “Cancel Task” outcome occurs, or if a task has reached a project or task deadline. Project control or tracking is an important step in the project risk analysis process. When you track a project that has uncertainties, you can apply newly obtained knowledge about project performance and recalculate the project so that it is an accurate reflection of the project’s progress. RiskyProject uses unique mathematical methods to calculate projected duration based on this tracking information. In addition, RiskyProject automatically updates the chances that specific task risks will occur. For example, if at the start of a task a risk has a 50% chance of occurring over the duration of the task, if the task is 50% complete, there is a reduced chance that the risk will occur. You can add information about each task. This is entered as the percentage of work done at a specific date. RiskyProject recalculates and shows an updated duration projection on a chart. After you add tracking data, you can recalculate your project schedule. RiskyProject applies the updated duration and chance of occurrence for risks. You can view the new project schedule on the Tracking Gantt chart. The Baseline schedule is also shown in the chart, so you can assess how your original estimates are different from actual project performance.